I remember when I first saw tiny ears of corn in a dish served at a Chinese restaurant. I was a teenager, and the sight made me feel so happy. My family ate a lot of corn on the cob, big ears with fat rows of plump kernels. The baby corn was so cute, it became one of my favorite things to add to a stir-fried meal. 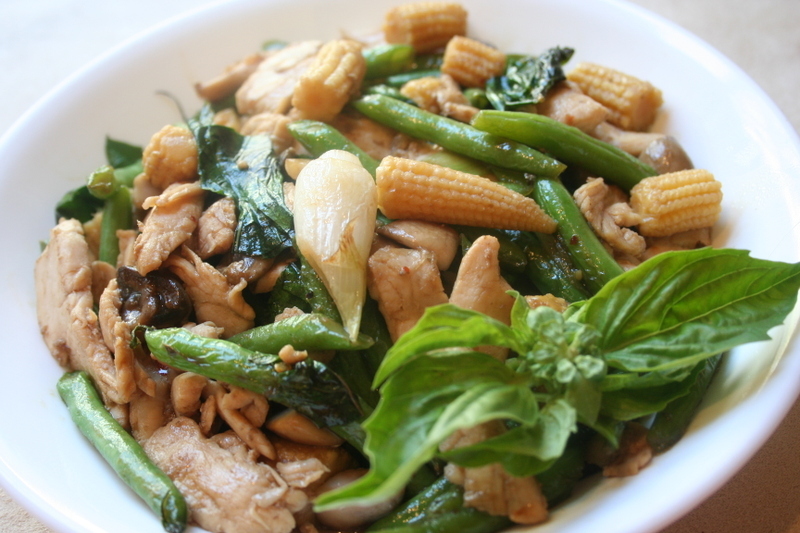 Here I offer a delicious and very easy to assemble dish of Thai Chicken With Mushrooms, Basil and Green beans--and tiny ears of corn. It also contains quite a bit of fresh basil, which makes it perfect for Weekend Herb Blogging, which was created by the fabulous Kalyn at Kalyn's Kitchen. WHB has traveled to Missouri this week and is being hosted by the lovely Glenna at A Fridge Full Of Food...And Nothing To Eat. Stop by her blog next Monday to see a Roundup of all the herby dishes. Besides the baby corn, my favorite ingredient in this dish was the cup of fresh basil leaves, torn and tossed into the wok at the last minute. Summer is right around the corner and basil is one of my favorite crops. It looks as wonderful as it tastes, with so many different varieties available to plant. So, enjoy this dish and think about the summer ahead of us. In a small bowl, mix the oyster sauce with the fish sauce and sugar. In a wok, heat 1/2 tablespoon of the oil over high heat. Add the beans and cook, stirring occasionally,until crisp-tender, about 5 minutes. Transfer to a plate. Add the remaining 2 tablespoons of oil to the wok and heat until smoking. Add the scallions, garlic and salt and stir-fry until the garlic is lightly golden, about 45 seconds. Add the chicken in 3 batches, waiting a few seconds between additions, and stir-fry until it barely turns white, about 2 minutes. Add the mushrooms, corn, jalapeños and green beans and stir-fry until the vegetables are crisp-tender, 2 to 3 minutes. Add the oyster sauce mixture and stir-fry until the chicken is cooked through, about 2 minutes longer. Stir in the basil, transfer to a platter and serve. did you use string beans too, they are delicious! Your baby corns remind me a WHB's post from Anh (not too long ago), she found 'fresh' baby corns! Mmmm...beautiful! I'd love to tuck into that! Hey! I love baby corn too. And I love everything about this dish, Sher. EVERYTHING! This is just the kind of dish I'm growing 7 varieties of Basil in the backyard for. Beautiful photo!! A perfect dish. Thanks so much. Sher, the chicken with basil and corn looks fabulous. And I missed the super round up of WHB! Each entry and your description is a treat. I'm going to come back to read it later. This looks fabulous. My husband loves baby corns - he will eat a whole can of them in one sitting! That is one happy bowl o' greens... I can practically smell the freshness! Oh, and I would kill to find fresh baby corns. I love anything with lots of basil. I planted some last week and I'm already out picking at them... And green beans...perfect for summer. Fresh bsby corns? They exist? How wonderful! beautiful photographs. this looks simply wonderful. I love the little corns, Sher! So cute! nice combination of ingredients and spicy! Wow..I've never seen a "fresh baby corn" at the farmers market! When are they in season? Love that Cat 3 name! I have never seen the baby corns for sale. If I had tons of land, I would grow them myself! YUM. Thank you! Wish we could share it. How I envy you!!! What a fabulous Farmer's Market you have! 7 varieties! That's fabulous. It must look beautiful! Yes--wouldn't it be marvelous to have fresh baby corns? That's on my wish list! Yes, it's so nice when we can get the cute veggies! Brings out the kid in me! Thank you, we really did like this one. I'll make it often. I've never seen them before either. I always use the canned ones. Wish I could find them!!! It looks just fantastic! I'd love to have something like this for dinner. Reminds me that I need to find Thai basil for my garden this year. It is almost lunchtime...chicken and veggies. I would much rather have this! What a nice dish! I love baby corn because they are so little and cute. You've done it again Sher. A fantastic recipe, wonderful ingredients and a beautiful photo! I will try growing basil again this year - this time indoors on the sun porch! Stir-fries are the best. I'll have to try basil in my next one! What a great dish. I love these baby corns, but have never seen them on the local market. The fabulous photos make my mouth water. Glad to see I'm not the only one who loves baby corn. I often eat it straight from the can! This chicken dish looks delicious. I can't wait to try it. yet again you got me with "ahs" and "oohs" while reading your recipes. 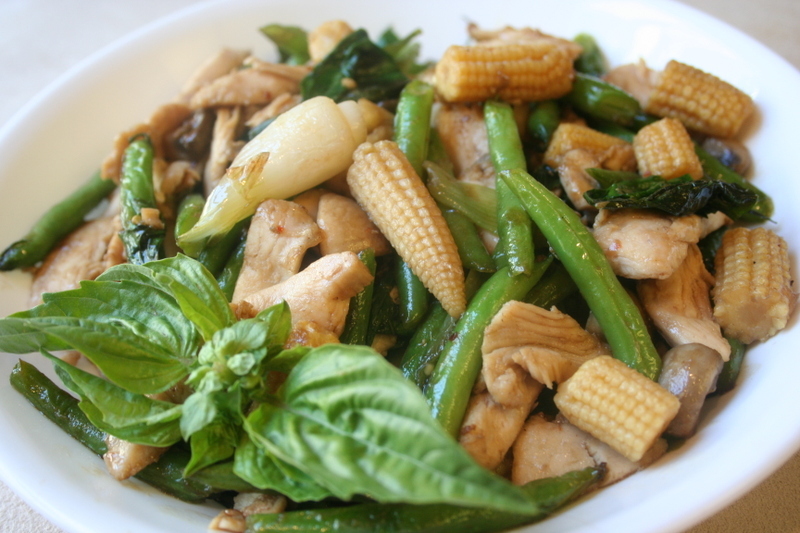 I love baby corn too and this stir fry looks very delicious!